How Can Landscape Lighting Boost Your Baltimore Home Security? Outdoor lighting has been used for security and aesthetics for many years now. People have a special appreciation for a well-lit home that highlights all of the best assets of the landscaping and home design. Security lighting has also become popular, though it isn’t usually aesthetically pleasing. Security lighting usually consists of some sort of very bright motion sensor light that goes off when people (or animals) come near the house. Luckily, we’ve come a long way in the world of outdoor lighting and have begun to mix security with aesthetics! Check out how even the most decorative lighting can help boost your Baltimore home security. Fashionably deter intruders – Home security lighting is proven to deter intruders from attempting to gain entry to your home. If your ambient lighting is on, there’s always the chance that someone could be home or that a neighbor will see an intruder attempting to get past your security system. Extra outdoor lighting also has the potential to help you lower your homeowner’s insurance payments, depending on your carrier and policy. It’s better to deter would-be criminals than it is to prosecute them later on. Feel safer coming home at night – No matter where you live, whether it’s an upscale single home neighborhood or a row home in the city, there’s always a little bit of anxiety associated with coming home late at night. 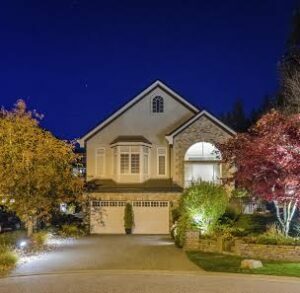 If you keep your outdoor landscape lighting on in the evenings, you’ll come home to a well-lit area that will allow you to see what’s going on around your home. This type of lighting will not only illuminate the area, but can also illuminate your favorite parts of your home. Choose from a variety of options – You can easily integrate nice ambient lighting with outdoor security lighting. There are many, many options when it comes to choosing landscape lighting today. You can choose to go with energy efficient lighting that will save you money and brighten up your space. If you like more subtle lighting, you can always do in-ground lighting or even recessed lighting in some cases. The options are almost endless and will give you the freedom to enjoy your outdoor space, while feeling safe and secure. Beyond the safety and security added to your property, outdoor lighting can be used to accentuate and highlight certain features of your landscape construction, such as walkways or decorative sculptures. Atlantic Maintenance Group has a reputation for greatness in the Delmarva area. When you’re ready to add a touch of security through outdoor lighting, give us a call at 410.768.4720 or visit the website today to get your free quote! This entry was posted on Friday, August 15th, 2014	at 4:32 pm	and is filed under Blog, Exterior Lighting	. You can follow any responses to this entry through the RSS 2.0	feed. Both comments and pings are currently closed.